It was a pretty intense and exciting day. 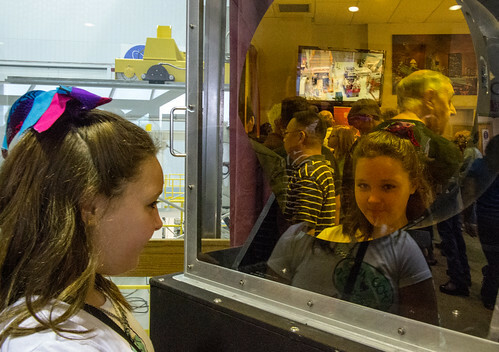 I had the great honor of getting to don a bunny suit to go inside our cleanroom and stand right next to the James Webb Space Telescope, where I answered questions from people watching through the observation window. My co-worker Nasreen Alkhateeb, one of our JWST video producers, did a great job making sure I was properly suited and mic’d up (it was only my second time in there ever, and she is a regular). Believe it or not, I did have anxiety dreams for two days before the event because I did not want to do anything incorrectly, not with our flight hardware so close by! Nothing went amiss, of course, but I will never ever forget being right there in front of instruments that are going to rewrite astronomy text books. It was a real privilege. 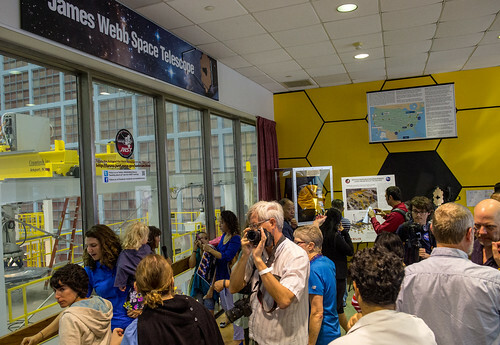 As someone who answers (or finds out the answers to) all the questions about JWST that come to us via social media and email, I have picked up a wealth of knowledge about the mission, so answering questions from the public was really fun. 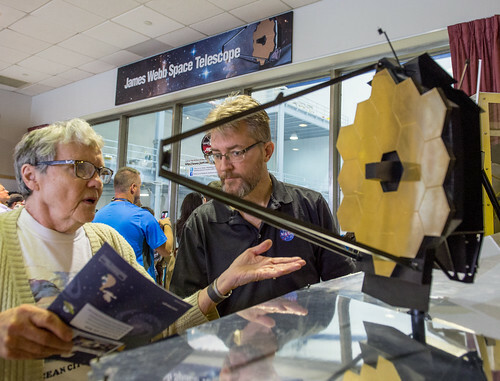 As I say in my little bio on this site, I love to talk about JWST because I think the mission is awesome, and not just because it’s my job to do so. Here is Nasreen and I in the cleanroom. 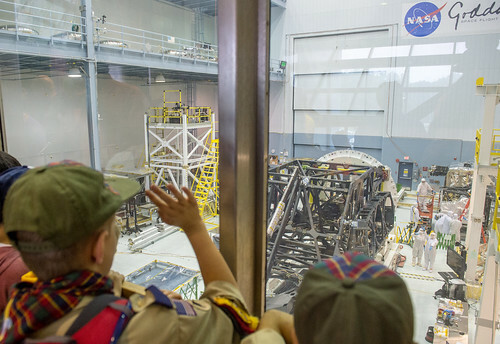 I’m the one on the right with my arms open in a V. The actual telescope structure (before any of the mirrors were installed on it) is face down near the center of the image. The flight science instruments are right in back of me. 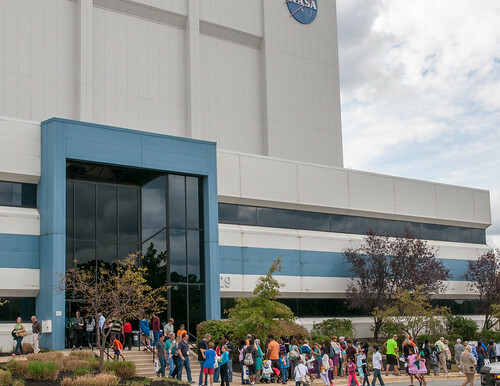 After my time in the cleanroom was up, Nasreen and I got de-bunny-suited and raced over to another building where we (along with a writer, photographer, and our lead video producer) gave a panel on how we tell the story of JWST. It went really well, and we ended up doing a similar panel recently at AwesomeCon. A quick food truck lunch later, and I found myself helping with crowd control on the side of the cleanroom windows opposite to where I’d been in the morning. 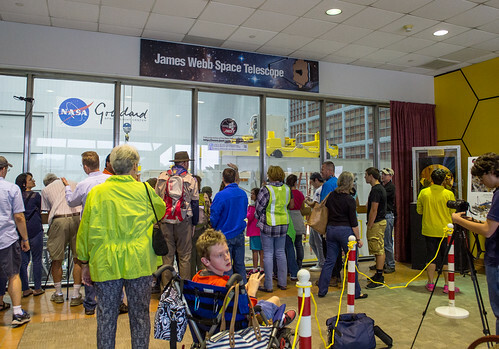 We had so many people lining up to see JWST that the line went all the way down the stairs, down the hallway, and into our Integration & Test facility! We wanted to get everyone through the line before the event ended, so after a while, we had to make people shuffle past like they were watching pandas at the zoo! 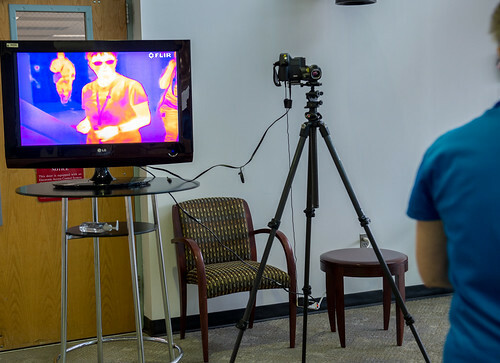 We also had infrared camera demonstrations (JWST sees infrared light) downstairs from the cleanroom that were quite popular. And ours was only one stop during a very full Goddard-wide event. 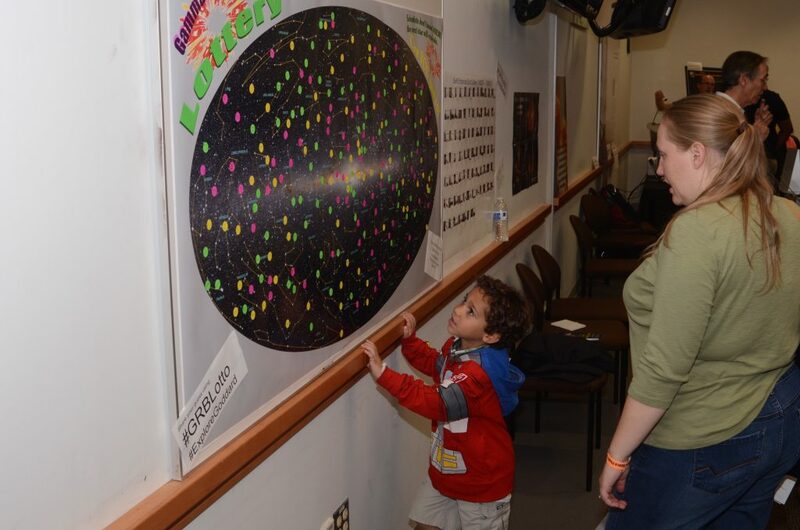 Over at Astrophysics Science Division Central, the public was learning how gravity works, participating in the GRB (gamma ray burst) lotto, and making their own gamma-ray constellations. I’m going to toss it over to Barb to talk about what they were doing. The group that studies gravity loves to share with people how gravity works and how gravitational waves could be formed and detected. 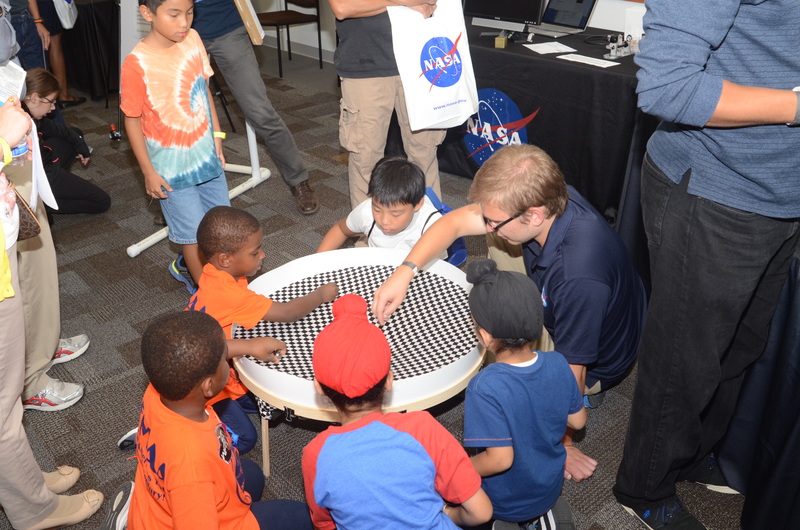 They had a huge hoop with checkerboard spandex stretched across it to demonstrate how mass (in this case metal spheres) dents spacetime. This was a big hit with everyone who came through our area. They were also showing off how a pair of pulsars orbiting each other slowly spiral in and eventually collide. This process emits gravitational radiation – a process very similar to the gravitational waves that LIGO detected, except LIGO detected two black holes colliding instead of pulsars. Swift studies elusive gamma-ray bursts (GRBs). What makes them so elusive? GRBs are so unpredictable that they are a bit like the lottery – you can’t predict when or where they are going to happen, just like you can’t predict what numbers will be pulled for the next big lottery. The Swift team held a GRB Lottery, where visitors put a sticker on an all-sky map to guess where the next GRB would happen. It was possible we could have seen a GRB during Explore@NASAGoddard, so we came prepared with a second map, just in case. We didn’t need it – in fact, the next GRB didn’t come until a week later. 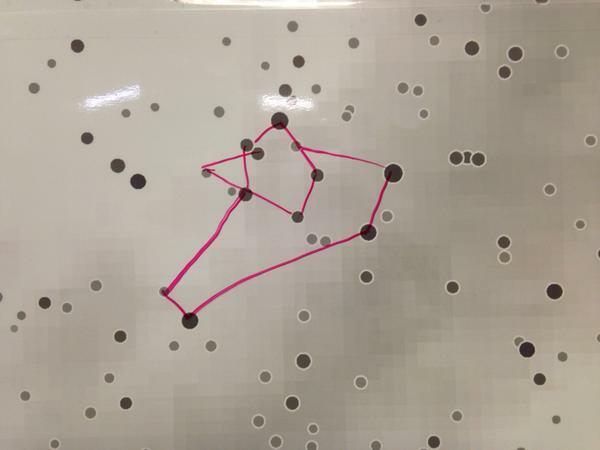 Recently the Fermi Large Area Telescope (LAT) folks released a catalog of gamma-ray point sources and noticed that the full-sky map looked perfect for creating constellations. 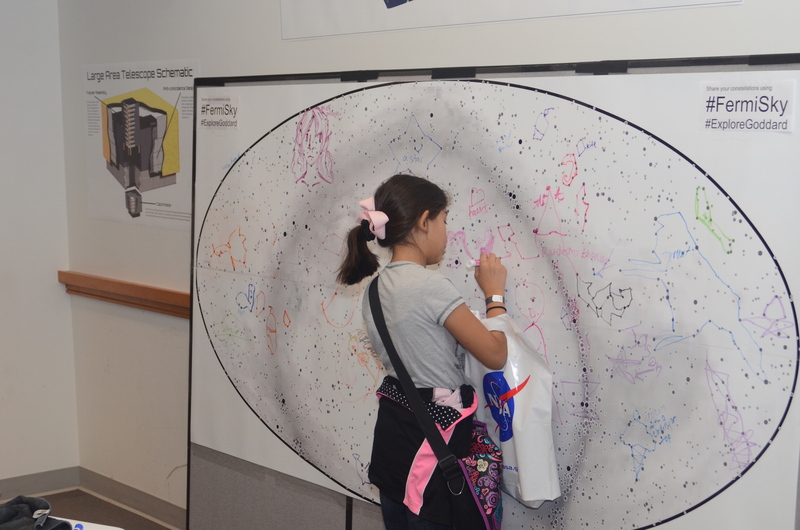 The LAT team is working on a set of constellations to celebrate Fermi and its science achievements (stay tuned for more on that later this year), but they also let the Explore@NASAGoddard visitors take their best shot at creating constellations. Sara even sent me this little JWST constellation. It was such a special day for us and for the public. 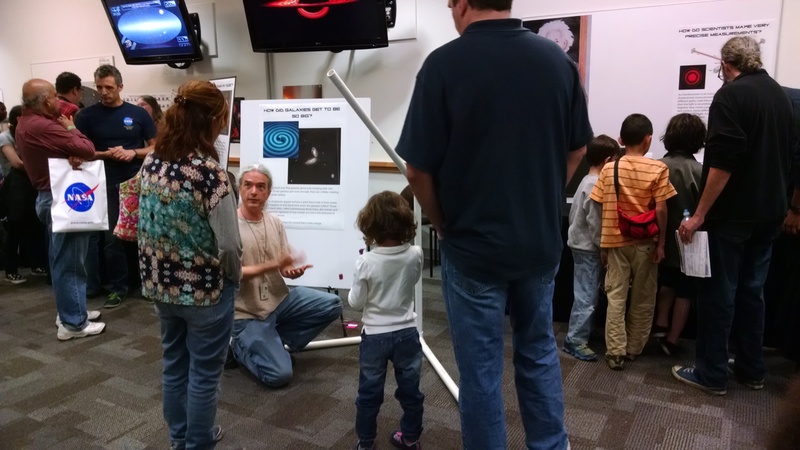 If you get a chance to come out for the next one – likely not for a few years? – it’ll definitely be worth your time.